Be the first to share your favorite memory, photo or story of Erwin "Fox". This memorial page is dedicated for family, friends and future generations to celebrate the life of their loved one. 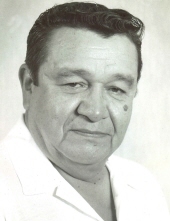 Erwin “Fox” J. Christjohn, 86, Oneida, passed away Thursday, October 18, 2018 surrounded by his family. He was born March 26, 1932 in Madison, WI to his father Harold and his mother Frances Christjohn. Fox played high school sports and graduated from Tigerton High School Class of 1950. Fox was a Korean War vet in the US Navy where he earned The Purple Heart. While in Milwaukee he met the former Karen Metoxen and they married April 26, 1960 in Illinois. He spent 30 years with the Teamsters Union where he was on the Executive Board and was the Strike Coordinator when they went to strike; which turned into one of the longest strikes. Fox really loved telling a good joke or hearing a good joke from anyone. He enjoyed watching the Brewers, baseball games in general, and the Packers games. His family, though, was his most loved possession he had in life; they meant everything to him. He is survived by his wife of 58 years Karen Christjohn; his sons: Daniel Christjohn, Tom (Lori) Christjohn, David Christjohn, Timothy Christjohn Sr, and Kevin Christjohn; his grandchildren: Daniel Jr, Kayla Marie, Marissa May, Leia Ann, Jacob Thomas, Jacinto, Fox Paul, Timothy Jr, Aaron, and Tyler; six great grandchildren; and his goddaughter Debbie Wilbur. Fox was preceded in death by his father Harold; mother Frances; grandmother Lucy Christjohn; aunts and uncles; and his beloved dogs Chico and Cisco. Family and friends may visit on Sunday, October 21, 2018 from 4:00 to 6:00 PM at Ryan Funeral Home & Crematory, 305 N. Tenth St, De Pere, with the Oneida Hymn Singers at 5:30 PM and a few words at 6:00 PM. Visitation will continue after 8:30AM Monday at the funeral home, until the procession leaves for church at 10:00AM. Fox’s funeral will be celebrated at 10:30AM at the Church of the Holy Apostles, Oneida, with burial to follow in the parish cemetery where his Full Military Rites will be accorded. Please go to www.ryanfh.com to send online condolences to the family. Fox’s family wants to thank everyone in the Oneida Community for anything and everything they did to support him and his family. Also, a thank you to the staff at ManorCare East for their compassionate care while he was there. To send flowers or a remembrance gift to the family of Erwin "Fox" J Christjohn, please visit our Tribute Store. "Email Address" would like to share the life celebration of Erwin "Fox" J Christjohn. Click on the "link" to go to share a favorite memory or leave a condolence message for the family.